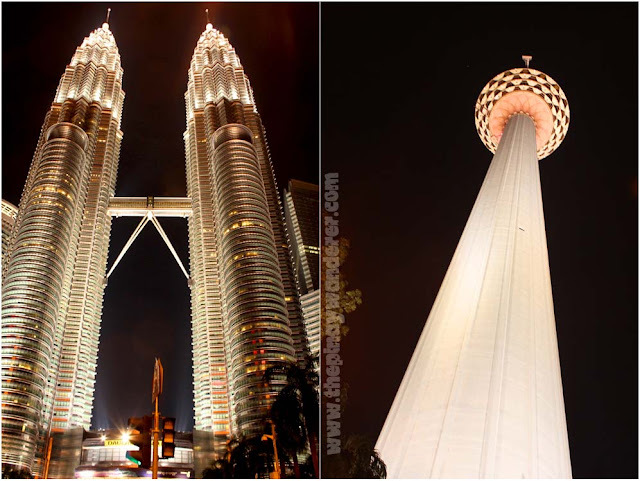 Petronas Twin Towers and KL Tower, at night! After our tiring climb to the Batu Caves, we headed back to the city's central district, this time via KTM Komuter train (there is a KTM station in Batu Caves). We alighted at the KL Sentral Station, first lost but later found our way to LRT Kelana Jaya Line. According to the rail map we have, one can transfer from one rail line to another via the KL Sentral Station; sad to say, we didn't find our way to the LRT line. We asked for directions but maybe because of some misunderstanding, the locals inadvertently led us to the exit so we ended up leaving the KL Sentral station and walking our way to LRT Kelana Jaya Line - Pasar Seni station. One station away from KL Sentral, on foot, imagine that! At the LRT Pasar Seni station, we bought tickets for Dang Wangi Station. At the Dang Wangi exit, we caught a glimpse of the KL Tower, our next destination. Again, we asked for directions going to the tower. 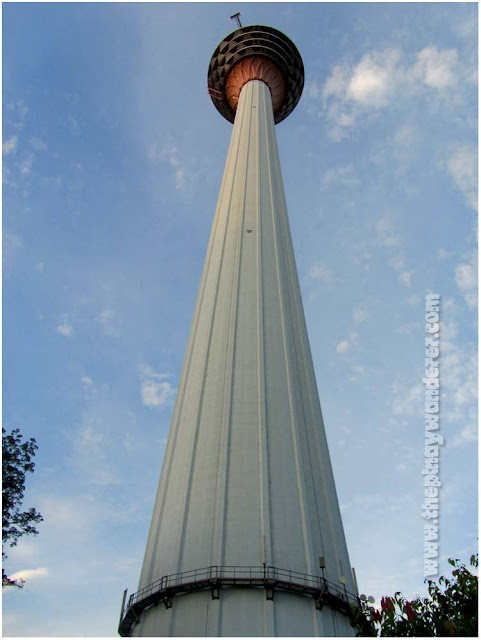 The local whom we asked for directions said that KL Tower is just around 500 meters away so instead of taking a cab, AGAIN we walked our way to the tower; we don't get tired, we are superwomen...hahaha! 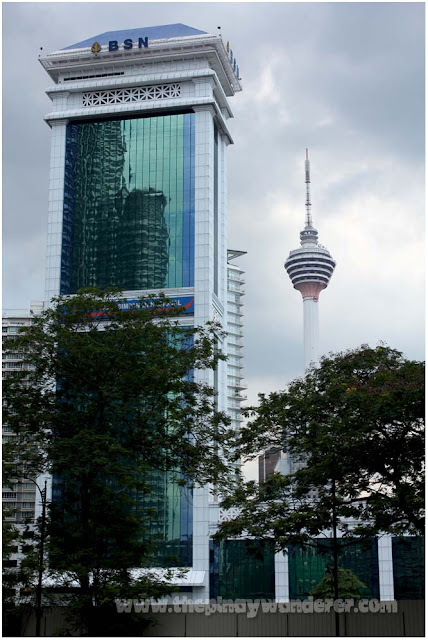 KL Tower has an observation deck where one can have a 360-degree view of Kuala Lumpur and the surrounding regions. To get to the deck, one has to avail of one of several packages available. For us, we bought just the basic package worth RM45 (PhP612, as of posting date) which includes a visit to the observation deck and a choice between pony ride or KL animal zone (there are 3 choices actually but I forgot the other one); we chose KL animal zone. At the observation deck, we were welcomed by the staff and were given an audio player and a headset that we can listen to while watching and seeing the breathtaking view of Kuala Lumpur outside. The audio player talks about the view that you would see in every window of the viewing deck. It's sunset time when we reached the deck. As the sunset creeps in, the golden color of the sky and flickering lights of the city below add to its charm, the view is simply breathtaking. Unfortunately, the reflecting light from inside the tower prevented me from taking more photos. After the viewing deck, we went to KL animal zone, an enclosure area that serves as mini zoo where several types of animals can be seen. If you have kids, this zone is a perfect add-on to a KL Tower package. We're all tired and hungry after our visit to KL Tower. On our way there, we saw KFC, so we traced our steps back and went there for our dinner. We're supposed to go straight to the hotel after dinner but as we left KFC, we saw from afar the amazing twin towers. I'd like to photograph the twin towers during the night so I asked my friends if we could go there. Though tired, they all agreed. And again, we asked a local for directions going to Petronas. As the local tells us the direction, a man appeared and overheard our conversation. Guess who the man is? A Filipino! 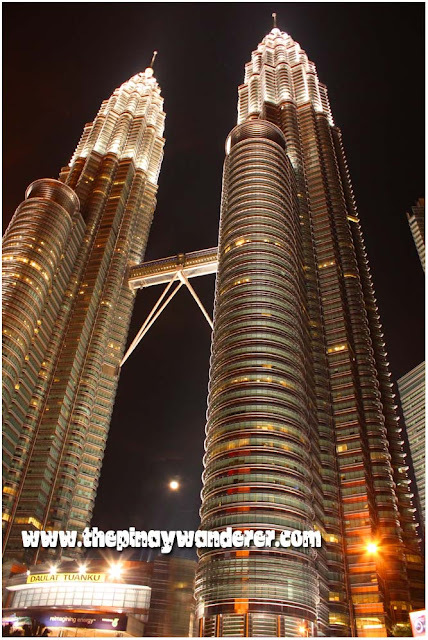 Yes, we met a Pinoy in KL, an OFW, who gladly pointed us to the right direction. 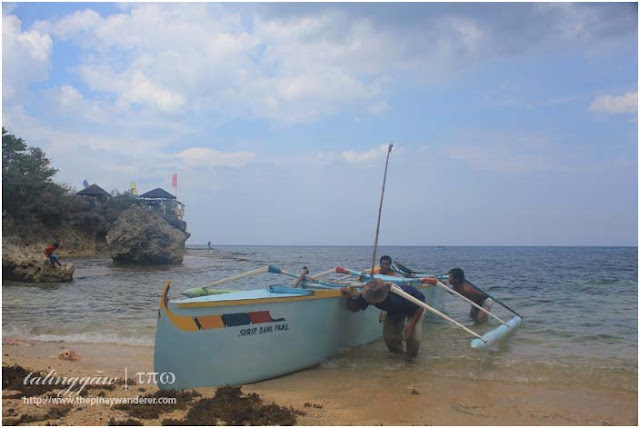 And since he's Pinoy, we spoke in Tagalog; thus, we didn't have a hard time understanding his instructions. 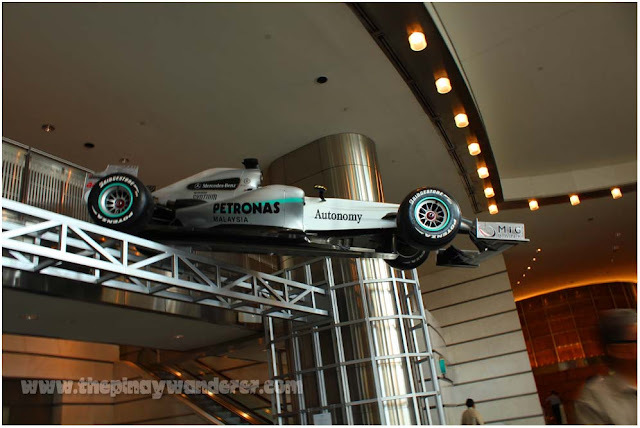 And off we went to Petronas, on foot AGAIN, I should add (we're superwomen remember, we never get tired, hahaha!). 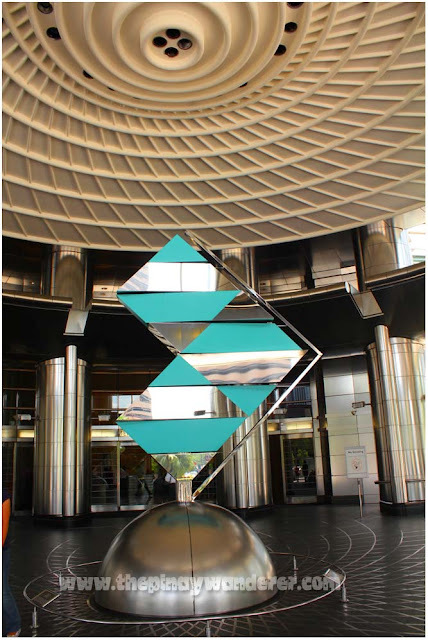 Menara Berkembar Petronas or more popularly known as the Petronas Twin Towers symbolizes innovation and progress in Malaysia; it epitomizes that of luxury and grandiose. 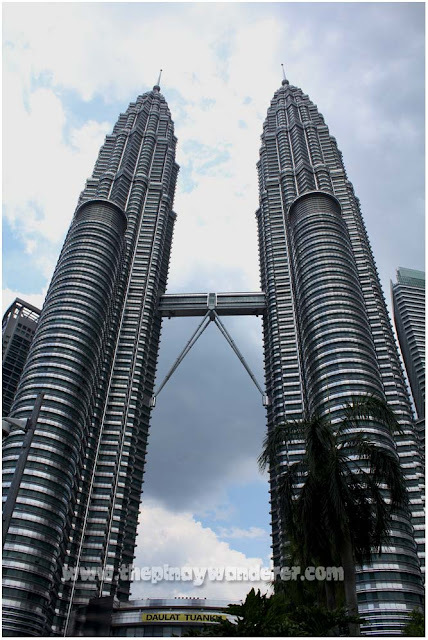 And though not the world's tallest building now, Petronas, standing at 1,483 feet, remains to be the world's tallest twin structures (source: KL tourism flyers). Standing high and mighty from afar, I can't help but be captivated with its beauty. I'm tired, me and my friends were all tired, but the magnificent beauty of these towers seemed so inviting, we can't help but get close to it like moths to a light. However, unlike moths that could get burned whenever they get too close to a light, these towers, with its bright light, seemed to guard and keep us on its watch. Until 11PM, we sat there at the corner of Jalan Ramlee and Jalan Ampang, looking at them, constantly clicking our cameras, captivated and in awe of its majestic beauty. Only when we realized that it's already too late did we get up and started to leave for our hotel. 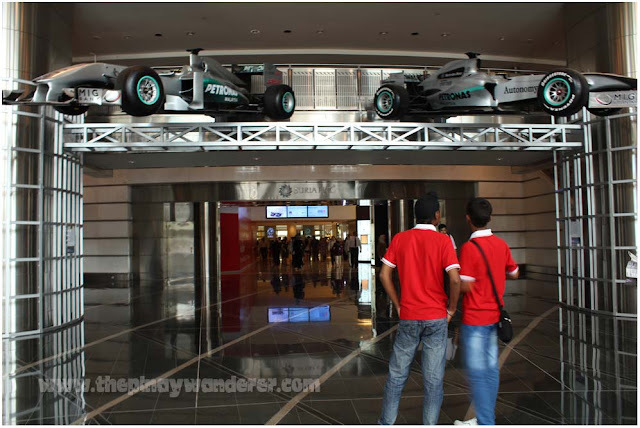 We're supposed to go up the Petronas observation deck the next morning but since we already had a view of Malaysia from the KL Tower, we opted to rest some more and just explore more of Petronas before our visit to Aquaria the day. 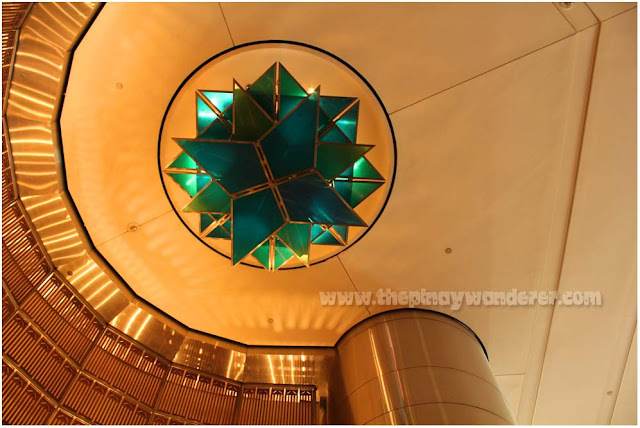 Anyway, here are some photos of Petronas Twin Towers, the building and its interior, taken during our next day visit. Note: You can't get good enough photos at night, if you want to capture Malaysia from the KL Tower, visit during daytime. Note: Need to be at the ticketing center on or before 5AM to secure tickets, only a limited number of tickets were sold per day, this according to our tour guide. Thanks sistah. You can travel by land from Malaysia to SG and vice-versa, I don't know about Thailand. Sana manalo ka sa lottery, tas pasabit sa gala mo ha...hehe! buti nalang may pinoy kundi bka itinuro na nmn kayo sa ibang direksiyon hehehe. Isa sa mga dream kong puntahan at makita itong petronas towers sa KL..
Ganda talaga ng Petronas Twin Towers sa gabi! Hay kelan kaya makapunta din dyan! This is on my list! please I need time for vacation!